How many nights a week do you cook dinner? Setting Saturdays and Sundays aside, I encourage you all to work toward cooking four to five nights out of the week. I understand that for some of you this may sound like a daunting or impossible task. If you are one of those people who already cooks Monday thru Friday then huge props to you! If you aren't cooking at all, start with one night, and if you are already cooking one night, then start cooking two nights and so on. I encourage you to set realistic goals whenever you are trying to make a change. I would never tell you if you have never cooked a homemade meal to immediately begin cooking every night. That is a sure fire way to become overwhelmed and quit altogether, so take it slow. This is all a journey that is forever shifting and changing, enjoy the journey. Where ever you are today in your process, I can guarantee it is not where you will be 3 months, 6 months or a year from now. Regardless of where you are in your own personal path toward health and wellness, I hope that these shopping lists and menus help to make your life easier, tastier, and healthier! Aside from drinking Green Juice (referencing my last blog), cooking for yourself is the number 1 way to improve your health. 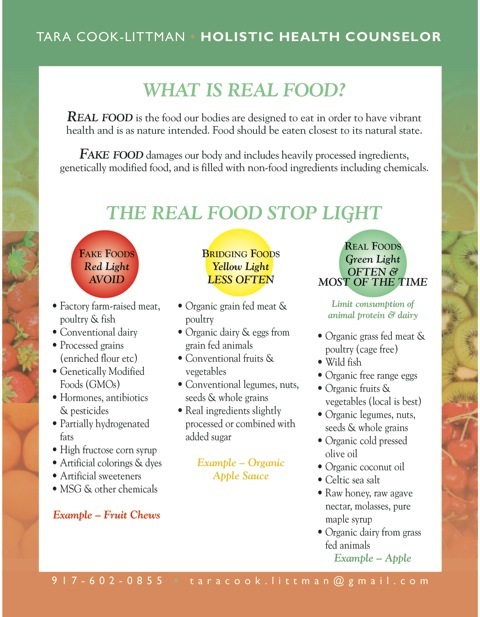 When you eat at a restaurant or bring food in, you truly have no idea what is going into your food. There are certainly exceptions to this rule, and one can find some amazing, healthful takeout options, but the majority of restaurants cook their food with excess amounts of salt, butter, and oil and do not use organic fruits, vegetables, or meat. I believe that everything you cook during the week should be simple to prepare and take very little time. I also believe that the flavor of the food should shine through rather than over saucing or salting your food, I say let the ingredients speak for themselves. There are a few things you should know about the way I cook. (1) I am never afraid to experiment with ingredients or amounts. Don't feel you need to follow each recipe exactly as written, I certainly do not. (2) I cook mostly vegetarian meals. In my real life, vegetables are the main dish. I personally do not eat chicken, beef or pork and only eat fish occasionally when I know the source. So, the majority of these recipes are vegetarian. In addition, I use organic dairy sparingly and it is optional in most of the dishes I prepare. I am not suggesting that you all run out and become vegans or vegetarians tomorrow, but what I am suggesting is that Americans eat too much animal protein. We are not meant to eat animal protein every day. If you are concerned you won't get enough protein without your meat, stop worrying, I assure you that you will get enough protein. This is clearly a topic for another blog, but wanted to make you aware that Vegetables take center stage in these recipes. I cook my family fish or chicken once a week, so 1 out 5 of these recipes will include chicken or fish. If you feel you need more animal protein at your meals, then at least consider making it a side dish to go along with these vegetarian recipes rather than the main dish. (3) I do not use any nuts in my recipes. There are two reasons for this. First of all, my son is allergic to all nuts so obviously nuts do not make it into my house. Secondly, unless nuts are first soaked and then dehydrated, they can be difficult to digest. (4) These recipes feed 4-5 people and have leftovers, so adjust accordingly depending on how many people you are cooking for. (5) You will use leftovers later in the week for your meals. I will make notes when to set aside some of the food for a future meal. I also use leftovers for lunch. (6) Many of the recipes are Tara originals or recipes I tweaked from somewhere else. I will make note when I get the recipe from some other source. (9) I eat gluten and wheat free so the majority of the recipes are wheat and gluten free. Even if you do not have a problem with wheat or gluten, trust me, we could all use a little less wheat and gluten in our lives. (10) Remember I am just a REAL person cooking in REAL life so if you have any questions about the recipes or it looks like I left something out, please reach out to me and I will answer any questions. What you will find below is a master shopping list with everything you need to prepare 5 nights worth of healthful dinners, plus the ingredients to make green juice. Feel free to use the recipes a la carte if you prefer, but I constantly hear from my friends and clients that they would cook more often if someone else planned the meals for them and told them everything they needed. In response to that request, I have done the meal planning for you. Also, many of my recipes use leftovers from previous meals. Remember, to set realistic goals for yourself and do NOT stress yourself out. If cooking ends up stressing you out then the health benefits from home cooked food will be cancelled out by all the damage the stress would be causing. So chill out, have fun in the kitchen, and enjoy your creations. I hope to be able to post a new week of dinner menus every few weeks or so. Happy Shopping and Cooking! Cook pasta in boiling water until slightly al dente. Combine the following ingredients in the food processor while the pasta is cooking: baby spinach, basil, garlic cloves, sunflower seeds, parmesan cheese, olive oil, rice milk, juice and zest of 1 lemon. Do NOT cook the sauce, rather toss it with the brown rice pasta while the pasta is still hot from cooking, chop up the tomatoes and add in to the pasta and serve. SALAD - In most homes this should be enough salad for Monday and Tuesday night, however, if you are like me, then you may want to double the amount of salad so you will be sure to have enough for Tuesday night as well. Soak the red lentils over night or for as long as you possibly can and then rinse well. Coat the bottom of the soup pot with the olive oil and place on medium heat. Chop the garlic and onion and cook until slightly tender. Add the carrots, celery and lentils. Add the Vegetable stock and stir. Then add the cumin and tomato sauce. Stir again and bring to a boil, once boiling, bring the heat back to simmer and cook for 30 minutes. Remove soup from heat and let cool. Use an immersion blender or a food processor to blend the soup together. If you do not own an immersion blender I highly recommend that you purchase one as you can blend the soup while it is still in the pot and it makes your life SO much easier. Pre heat the oven to 350. Boil 6 cups of water and add the quinoa, reduce to a simmer and cover. If you have never cooked quinoa, it's similar to cooking rice or cous cous. It should take approximately 10 minutes for the quinoa to cook. Once the quinoa is cooked, put 1/3 of the quinoa aside for dinner on Thursday night. While the quinoa is cooking prepare the peppers by slicing the top off and clean out the inside, keep the tops of the peppers. Combine the quinoa with 1/2 of the jar of sauce. Fill the peppers with the quinoa and sauce mixture. Pour the rest of the of the sauce over the peppers, sprinkle with parmesan cheese if you would like, and put the tops of the peppers back on top. Bake in the oven for approximately 30 minutes or until the peppers are tender. Toss the arugula with the truffle oil and juice of 1 lemon. For extra lemon flavor, zest the yellow skin of the lemon into the salad. Sprinkle with the pumpkin seeds. Slice the peppers, onion and mushrooms in strips. Lightly coat a saute pan with grape seed oil. Add the onion and saute on medium heat until soft, add the peppers and saute until tender, add the mushrooms and squeeze the juice of the lime onto the vegetables. Remove vegetables from heat and add the cayenne, garlic powder, and paprika to taste (I suggested a teaspoon of each). Serve with the tortillas and guacomole. Mash up the avocados. Add the lime and lemon juice. Chop up the onion finely and add. Add salt and pepper to taste. A little hint to keep the guacamole green - keep a pit in the guacamole. Combine the black beans, quinoa, apple cider vinegar, olive oil and salt and pepper in a bowl. Chop the fresh mint and sprinkle on top. This is very simple to prepare. Obviously, canned beans save time, however, if you have the time, preparing your own beans is actually quite simple. Soak your beans overnight or all day. Rinse before cooking. Bring about six cups of water to a boil and add the beans, lower heat and simmer for 45 minutes. Add a piece of kombu (a sea vegetable) for added minerals and to make the beans more digestible. Preheat oven to 425. Combine Turkey meat with paprika and garlic powder. Form small, slider sized patties. Place patties on a baking sheet. Bake burgers for 15 minutes. Pre heat oven to 425. Slice sweet potatoes into thin round circles. Toss with Grapeseed oil. Coat the sweet potatoes lightly, you do not want them swimming in the oil. Bake for 25 minutes and then flip sweet potatoes over. Bake for another 25 minutes or until crispy. Sprinkle with celtic sea salt. There are two ways to prepare kale chips: In a traditional oven or in a dehydrator (if you have one). Remove the kale leaves from the stems and place in a bowl. Lightly coat the kale with olive oil and liberally sprinkle nutritional yeast. Toss all ingredients together. If you are dehydrating the kale, spread the kale onto the sheets and set the dehydrator on 115. Leave the dehydrator on until the kale becomes crispy. This will usually take about 3 hours (longer is fine too - for instance you can leave it on overnight). If you are baking the kale chips, preheat your oven to 350 and bake for 10 minutes or until the edges of the kale is slightly browned but not burnt. IN REAL LIFE EVERYTHING GETS SCHEDULED: WHY NOT SCHEDULE SHOPPING AND COOKING? Just like you schedule a meeting or a Dr. appointment, schedule your shopping time. That's right, take out your little smart phone and schedule when you plan to do your main shopping trip for the week and when you will do your fill in shopping. I recommend Sundays for your main shopping trip because for most people, Sundays have a little more flexibility than other days and that way you set yourself up for a successful week of cooking. When you go shopping, bring your list. Trust me, you won't remember everything. Without your list, you know you will spend more time trying to remember what it is you are supposed to buy, and then you will forget something anyway and have to make a second trip to the store. I have made this mistake many times and it is so frustrating. Once you schedule your shopping trip, stick to it. Preparation is the key. Organize yourself, look at what your days look like, and schedule when you plan to cook. Don't keep waiting for a free moment because that free moment will never come. That's the thing about real life, it gets busy. Everyone's days look different. We come in all different variations. Whether you are single, married, have children, don't have children, work full time out of the house, work full time in the house, or work part time, your days are full. Let's not be judgemental as to whose day is busier, rather, let's find encouragement in knowing that no matter what path you are on right now, everyone in today's society is overtaxed and doesn't seem to have enough time in the day. Regardless of what your typical day looks like, take the time to analyze your own day and figure out when you can squeeze in the cooking. For instance, I do most of my cooking on Sunday afternoons and evenings, and during the week between 2:00 and 3:00 in the afternoon. I enjoy cooking and preparing on Sunday because it gets me out of having to watch football :). I choose the 1 hour window between 2:00 and 3:00 during the week because at that point I have finished my morning workout, my meetings, my clients and any additional food shopping I needed to do. 2:00 is also right after I pick up my pre-schooler but right before I pick up my two elementary school kids. I know that between the hours of 3:00 and 6:00 there will be absolutely no cooking going on in my house. Instead I am chauffeuring the kids to their activities, helping them with their homework (which no one tells you is actually the parents' homework), bathing the kids, and trying to keep myself sane. If I did not take the time to reflect on my days and schedule that cooking time, 6:00 would arrive with no dinner prepared and I would immediately pick up the phone and order in pizza. When are your free moments? Maybe you work full time and can't imagine starting to cook when you arrive home. If that is you, preparing in advance becomes even more important. Maybe the only time you have to cook is over the weekend and so you prepare everything in advance and freeze certain things. You can also consider cooking or preparing in the morning. Chop all the vegetables you need first thing in the morning so they are all ready for later in the day. Only you can figure out when to make time, but I believe that saying there is no time for cooking is just not true. There is always time for the things we make a priority in our life. Make cooking a priority for you and your loved ones. For assistance with your cooking and shopping ventures please see my next blog, "Real Dinners - Week 1". Writing about Green Juice for my first blog seemed like the appropriate choice since it was green juice that I credit with changing my life and probably saving it. Most Americans today walk around feeling exhausted and sick, relying on sugar and coffee to perk themselves up. That was me a little over four years ago. I just didn't feel right and by 3:00 in the afternoon I was ready for bed. As a mom with three young children, I needed to do better. I wanted to do better and wanted to feel like I remembered feeling in my 20's. I always suggest making changes to your diet and lifestyle slowly so as not to become overwhelmed. There always needs to be a first step. My suggestion for your first step is to incorporate fresh pressed green juice into your life. I personally cannot go a day without 1 - 3 green juices. Maybe for you, it's starting with one green juice a week. Whatever the right starting point is for you, just start!!! I was introduced to the concept of Green Juice by my amazing and very successful friend who owns Blueprint cleanse based in New York City (www.blueprintcleanse.com). After drinking only fresh pressed juice for three days I was hooked. My energy level skyrocketed. I remember picking my daughter up from pre school one day after drinking a green juice and one of my friends asked me if I was on crack because I was bouncing off the walls and she wanted whatever it was I was taking. I immediately bought a breville juicer and thus began my biweekly outings to Whole Foods to stock up on Kale, Romaine, Cucumbers, celery, green apples, lemon and ginger so that I could create a juice similar to Blueprint. Blueprint juice can now be found at many Whole Foods locations in CT and NY and can also be shipped directly to your home. After a few months of drinking green juice, health issues that Doctors were unable to treat began to disappear. There was no turning back for me now, I had found the universal healer, green juice. Even before I became a certified Holistic Health Counselor, I was spreading the gospel of green juice, bringing it with me to meetings and to yoga class, if you entered my home you were going to try my green masterpiece. Some people loved it at first, others slowly learned to like it and still others have not gotten on the green juice wagon quite yet. But, one day I'd love to figure out how many of my loved ones turned into green juice drinking happy people because of me. The more I drank green juice, the more my body craved it. My therapist friend who specializes in treating addiction at Yale University thinks I sound like an addict when I speak about green juice . . . I say the whole world should have an addiction to green juice. The whole world seems to be addicted to caffeine, an actual drug I might add, and it is certainly easy enough to satisfy that craving at all the coffee shops located on every corner in Main Street USA. Let me tell you, making green juice for myself was not easy day in and day out and I actually started to resent coffee shops for existing and wished they could all be replaced by juice bars. Knowing that was not likely to happen anytime soon, I simply asked the universe to provide me with one juice bar in my lovely town, Fairfield, CT. My yoga instructor always said ask the universe and it will provide. Well, after about two years of begging the universe for a juice bar in Fairfield, the universe provided me with Catch A Healthy Habit Cafe. It's at this cafe where you can now buy "The Tara". After ordering the same green juice every day for 1 1/2 years and sending in countless people to order green juice Tara's way, Glen and Lisa, the amazing owners of Catch A Health Habit, thought it would be easier to put "The Tara" on the menu. I am told it is the most popular drink on their menu now. Every time I am in the cafe and I hear someone order the Tara, I smile and giggle to myself and I am beyond thrilled that other people are finding the magic in green juice. The benefits of drinking green juice are many. First of all, most of us do not eat nearly enough fruits and vegetables, thus, we are not getting the essential vitamins and nutrients our bodies need to function properly and heal. My green juice includes an entire bunch of kale, a head of romaine, a cucumber, 5 stalks of celery, a green apple, a lemon, and fresh ginger. Do you have any idea how many minerals, vitamins, and enzymes are in that one glass of juice? It is impossible to eat all of this in one sitting, but by juicing it, you get all those nutrients fast. Your cells drink up that green juice and all those nutrients go to work for you immediately without your body having to do any of the heavy lifting. The juice has a plethora of its own enzymes and is in an easily digestible form. Many people have a difficult time throwing away the pulp and fiber that gets separated from the juice. You just have to get over that! When juicing, you want your cells to swallow up those nutrients as fast as possible. The fiber would only slow digestion, tax your digestive system and delay the good stuff from fueling your cells. I'm not saying fiber isn't important, it just has no place in your green juice. Eat your veggies, whole grains, flax seeds and chia seeds for fiber. Drink your green juice for a fast boost of vitamins, minerals, nutrients and enzymes. Green smoothies, which are made in a blender and thus still have all the fiber, are also a fantastic addition to your diet but should not be drunk in lieu of green juice. Some amazing side affects of Green Juice to consider. . . (1) Juicing reverses the signs of aging! That is right, wrinkles fade away. Now I'm not saying you will be left with no wrinkles, but most of us experience pre-mature aging and have way more wrinkles in our skin than we should. Juicing will help you look younger; (2) Juicing can help you lose weight and maintain a healthy weight! Consider a juice cleanse someday and really watch the lbs fly off; (3) Juicing will help you go to the bathroom regularly! Constipation is a huge problem for many people. Keeping those bowels moving is essential to staying healthy and juicing really helps to keep things moving along; (4) Juicing will give you clearer skin and bright eyes leaving you with an unmistakeable glow. Hopefully I have convinced you that juicing is something you want to do for yourself, so the obvious question is how to start juicing. I've already mentioned Blue Print Cleanse and Catch A Healthy Habit. Juice bars seem to be sprouting up everywhere these days, so no matter where you live you should be able to find a place that sells green juice. Even if you find a local place to buy green juice, I still recommend you buy a juicer. There are a lot of juicers on the market today but I recommend either the Breville Juicers (http://www.brevilleusa.com/beverages/juicers.html) or the Omega Vert (http://www.bestjuicers.com/omegavert.html). These are two different types of juicers. If you are new to juicing I highly recommend going with the Breville. You can actually buy one at Bed, Bath and Beyond for under $200. The Breville is easy to use, easy to clean, and very fast. The downside to this kind of juicer is that the juice needs to be drank immediately as the enzymes and nutrients begin to break down because of how the juice is produced. The Omega Vert is theoretically a better juicer because it extracts more juice and lasts longer in the refrigerator. If you are busy and don't have much free time, Breville is the way to go. I have both the Breville and the Omega Vert and to be completely honest I reach for my Breville more often. So now you are ready to start juicing! Please make sure you are juicing organic veggies and fruit. We don't want pesticides and herbicides in your juice along with all those nutrients. Feel free to experiment with what you juice. My favorite combination is Kale, Romaine, Celery, Green Apple, Ginger, and Lemon. There are fabulous books out there about Juicing with many wonderful recipes. One of my favorite raw food / juicing books is "The Raw Food Detox Diet" by Natalia Rose. Don't wait another day, start juicing now! Trust me, your body will thank you.